Two very different galaxies feature in this image taken by the Hubble Space Telescope, forming a peculiar galaxy pair called Arp 116. A stunning new photo from the Hubble Space Telescope has captured the perfect galactic portrait: two galaxies that are so different from one another, yet together represent most known galaxies in our universe. 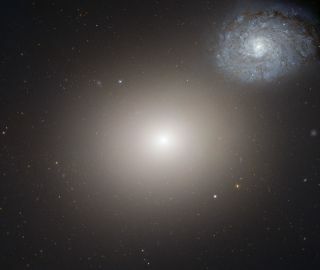 The new Hubble picture shows the elliptical galaxy Messier 60, and the spiral NGC 4647. Together, the pair is known as Arp 116. These two types of galaxies (spiral and elliptical) are thought to include most of the galaxies found in the cosmos. Our Milky Way galaxy, for example, is a spiral, as is our nearest neighbor Andromeda. Spiral galaxies contain more young, hot stars that shine in bright blue light, delineating their swirling spiral arms. Ellipticals, meanwhile, appear more uniform, like glowing orbs. They are generally older, filled with aging stars that are cooler and redder. In the new photo, Messier 60 glows in golden light, while the smaller NGC 4647 swirls to the side in purple. The image combines visible and infrared light collected by Hubble's Advanced Camera for Surveys and Wide Field and Planetary Camera 2. Scientists are trying to figure out of the two galaxies are close enough to be interacting. Within a certain range, the galaxies' mutual gravitational attraction will disrupt gas clouds in each, causing them to collapse and stimulating a burst of new star formation. So far, researchers have not seen strong indications of star formation in these galaxies, but the new Hubble photo shows new details that suggest some gravitational interaction between them. "Regardless of whether they are actually close enough to be interacting, however, the two galaxies are certainly near neighbors," Hubble scientists wrote in a statement. "This means we see the two galaxies at the same scale, making Hubble’s family portrait a textbook example of how giant elliptical galaxies differ in size, structure and color from their smaller spiral brethren." The Hubble Space Telescope launched in 1990, and after five space shuttle servicing missions, it is still going strong. The telescope is managed by NASA and the European Space Agency.